If you rock the bottle from side to side you can create a wave like motion of the water, looking just like a little ocean in a bottle; see what kind of waves you can make! I have discussed density in more detail in this previous post as well as sharing lots more density experiments. 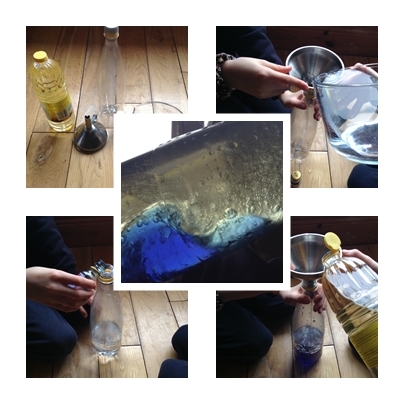 If you get bored of your ocean in a bottle, why not stand it upright again and add some Alka Seltzer tablets to instantly turn it into a lava lamp! Density is the mass of an object per unit volume. A bit of a mouthful but this is how I explained it to my own children today…. …imagine you have a pebble and a marshmallow of the same size and shape… which one do you think is heavier? My three year old got this straight away… “the pebble of course Mum” (with a “silly question” look that I am use to at this stage). The Fun Friday Science Team! So if they are the same size (volume) then why does one weigh so much more than the other? If you remember that everything is made up of molecules… the heavier object simply has more molecules packed more tightly together (a greater mass); the molecules in the lighter object (in this case the marshmallow) are much more loosely packed together (a smaller mass)! The pebble is said to have a greater density than the marshmallow. A Greek scientist called Archimedes (250 BC) is credited with discovering the concept of density. The story goes that Archimedes was given the task of determining if the newly minted King’s gold coins were genuine (or if they had been mixed with silver). Archimedes was pondering this idea while lowering himself into the bath. When he noticed how his body displaced a volume of water he realised he had cracked it! If he compared a coin of pure gold with the newly minted ones he could check if they displaced the same amount of water i.e. that their densities were the same. Turns out they were not and the King was beings duped! They say that Archimedes was so excited when he realised the solution that he jumped out of the bath and ran all the way home naked shouting “Eureka, Eureka”…. (“I found it, I found it” in Greek). The children and I spent the afternoon trying out these cool experiments that are easy to do at home. Hope you get to try some too! A clear glass, golden syrup or honey, maple syrup, milk, washing up liquid, water, food colouring, cooking oil or baby oil, a clear alcohol (we used isopropanol but you could use methylated spirits or vodka – with adult supervision! ), funnels, a dropper or a spoon. Place some water in a glass and add a few drops of food colouring and mix. Place some alcohol in another glass and add a few drops of a different food colouring. Mix. Carefully add each layer in the following order…. Try to add each layer carefully down the side of the glass, using a spoon, a dropper or a funnel (as below). Make sure each liquid makes a complete layer that fully covers the layer underneath. If the layers mix a little, allow to settle before adding the next layer. Two junior scientists admiring their work! We think it looks lovely! We added the most dense material first (the golden syrup) and then the next dense and so on. So each layer is a little lighter or less dense than the previous one and therefore floats on it. You can of course add other things are leave some of these layers out! You will need: a clear glass, sunflower/vegetable oil, water, food colouring, some effervescent tablets such as AlkaSeltzer. What to do: Place water in the glass to about one third full. Add a few drops of food colouring to the water and mix. Gently pour the oil down the side of the glass filling the glass to almost the top. If the oil and water mix a little don’t worry, just wait a while until the two layers separate out with the oil sitting on top of the water. Break the tablet into pieces and add one or two pieces to the glass…. I will let Caer explain it to you (with a little prompting from her brother)! When the AlkaSeltzer tablet reaches the water layer it starts to dissolve and fizz, releasing a gas called carbon dioxide. This gas forms in small bubbles surrounded by water, they start to rise to the top of the glass because the gas is lighter (less dense) than the water and oil. The bubbles pass all the way through the oil layer to the top of the glass where the bubble eventually bursts, releasing the carbon dioxide gas. Once the gas is gone the bubble is just water, which is heavier (more dense) than the oil so it starts to drop down again. The process continues until all the carbon dioxide has escaped to the top. Adding more AlkaSeltzer starts it all off again! What to do: Fill the glass with water to about two thirds full. Carefully pour a layer of oil on top of the water to fill the glass. Add drops of food colouring to the top of the oil layer and watch as they slowly drop down and enter the water layer. They streak through it like some mini fireworks! …and wait for the fireworks display to begin! Food colouring and oil do not mix so the drops will fall until they meet the water layer. Food colouring dissolves in water, the colour diffuses out into the water as the drops fall to the bottom of the glass, giving a lovely fireworks type display! Hope you enjoyed this week’s Fun Friday as much as we did. If you have any comments, questions or suggestions please leave a comment below, I always love the chat and feedback!